I promise you that your quilt will get the same attention and care that I would give one of my own. Give me a call or email me and we can discuss details for your project. Notice: Please note that pricing changes go in effect as of February 1, 2018. Please see my Pricing page for specifics. Arrangements can be made to meet if you need to consult on design options. Call or email me for instructions if you want to meet or ship your quilt to me. 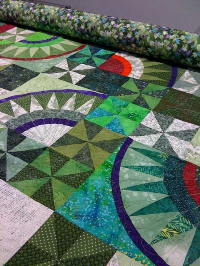 Be sure to check the 'quilt preparation' and 'pricing' links for preparing your quilt for the longarm.